The Southern Folklife Collection (SFC) at the University of North Carolina at Chapel Hill is among the leading folklife archives in the country, containing extensive documentary material for southern traditional and vernacular culture, including musical and oral traditions as well as mainstream media production. Centered around the John Edwards Memorial Collection and the UNC Folklore Archives, the SFC is especially rich in materials documenting the emergence of old-time, country-western, hillbilly, bluegrass, blues, gospel, Cajun, and zydeco music. With materials donated by Ralph Steele Boggs, Arthur Palmer Hudson, and Guy B. Johnson, among others, the UNC Folklore Curriculum faculty established the Folklore Archives in 1968. The John Edwards Memorial Foundation formed in California in 1962 as an archive and research center named for the young Australian record collector. Following Edwards's death in 1960, his remarkable collection of American country music records, along with a wealth of correspondence and other research materials, was strengthened by additions from his American friends and colleagues, including Eugene Earle, Archie Green, D. K. Wilgus, Ken Griffis, Ed Kahn, and Norm Cohen. In 1983 UNC purchased the John Edwards Memorial Collection, and in the fall of 1986, the UNC Folklore Archives and the Edwards collection were combined to form the Southern Folklife Collection. 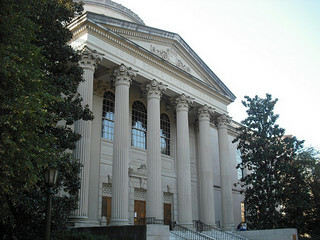 The SFC is a component of the Manuscripts Department of the UNC-Chapel Hill Academic Affairs Library, which also houses the Southern Historical Collection and the UNC University Archives. The Southern Folklife Collection officially opened for research during the Sounds of the South Conference at UNC in April 1989. The Southern Folklife Collection contains nearly 82,000 sound recordings, including cylinders, acetate discs, wire recordings, 78-rpm and 45-rpm discs, LPs, cassettes, CDs, and open-reel tapes. Moving image materials include over 3,000 video recordings and 18 million feet of motion picture film. Paper-based materials include thousands of photographs, song folios, posters, manuscript materials, ephemeral items and research files. "Louis Wilson Round Library." Image courtesy of Flickr user benuski, taken on October 6, 2008. Available from http://www.flickr.com/photos/benuski/3451996330/ (accessed May 30, 2012).